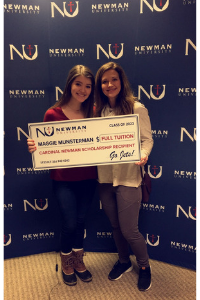 Maggie Munsterman of Summit Christian Academy in Lee’s Summit, Missouri, was one of five high school seniors recently awarded the Cardinal Newman Scholarship, Newman University’s highest and most prestigious financial award that covers four years of tuition at the university. 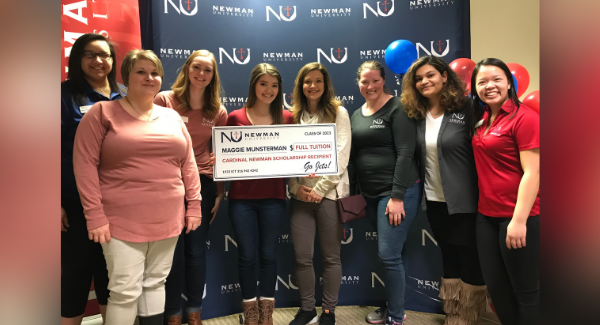 Munsterman visited campus Friday, Feb. 8, and was presented with an oversized check, balloons and a basket of candy from the admissions team in congratulations. Maggie Munsterman and her mother, Joy Munsterman, receive congratulations at Newman University. Munsterman presented an outstanding academic record and heavy involvement in extracurricular activities, work, community service and civic engagement. She is active in her high school’s student council, writers’ corner and cheerleading and also holds the roles of student ambassador and Bible study leader, among others. She is highly involved in community service initiatives, has achieved honors through the National Honors Society and National Society of High School Scholars and is active in her local church’s youth ministries. 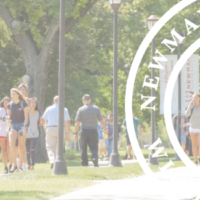 Munsterman has plans to major in the business program at Newman University. She looks forward to the lessons learned in college both inside and outside of the classroom. “Personally, I want to kindle the fire of change by intentionally caring about each person I encounter and serving my community,” she said.